(Newser) – A memoir by Japanese Emperor Hirohito that offers his recollections of World War II is predicted to fetch between $100,000 and $150,000 at an auction in New York. The 173-page document was dictated to his aides soon after the end of the war. It was created at the request of Gen. Douglas MacArthur, whose administration controlled Japan at the time. The memoir, also known as the imperial monologue, covers events from the Japanese assassination of Manchurian warlord Zhang Zuolin in 1928 to the emperor's surrender broadcast recorded on Aug. 14, 1945. The document's contents caused a sensation when they were first published in Japan in 1990, just after the emperor's death, reports the AP. The two volumes being auctioned are each bound with strings, the contents written vertically in pencil. It was transcribed by Hidenari Terasaki, an imperial aide and former diplomat who served as a translator when Hirohito met with MacArthur. The monologue is believed among historians to be a carefully crafted text intended to defend Hirohito's responsibility in case he was prosecuted after the war. A 1997 documentary on Japan's NHK television found an English translation of the memoir that supports that view. 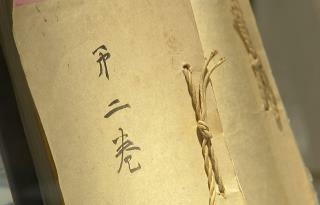 The transcript was kept by Terasaki's American wife, Gwen Terasaki, after his death in 1951 and then handed over to their daughter Mariko Terasaki Miller and her family. It's scheduled to be auctioned at Bonhams on Wednesday. Wow that doesn't sound like much money for something seemingly so historic. a GOOD READ, FOR THE hISTORY BUFF.